BUY-IN DEAL! Get the bundle at 50% off for a limited time! Regular price: $16. Get the bundle for $8 now. 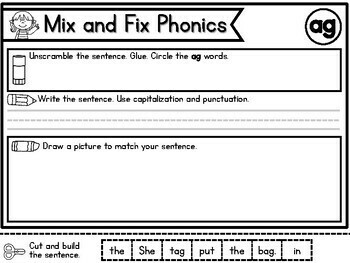 Mix & Fix Phonics Bundle is an engaging, hands-on, and effective Word Work tool that requires students to manipulate words in order to build phonics sentences. 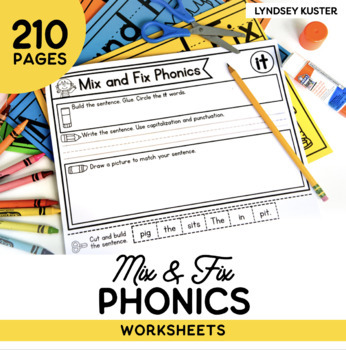 There are over 200 phonics sheets included in this bundle (2 sheets per sound-spelling, multiple words with the same focus sound-spelling on each sheet). The simple step-by-step I Can directions help ensure student success. 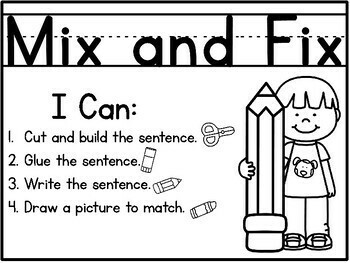 First, students will cut out and build the sentence. 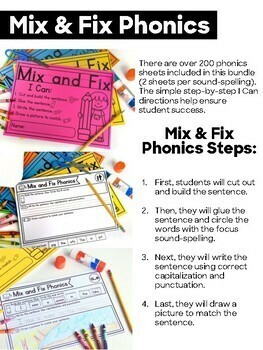 Then, they will glue the sentence and circle the words with the focus sound-spelling. Next, they will write the sentence using correct capitalization and punctuation. Last, they will draw a picture to match the sentence. You can use these sheets during small group instruction time, at your Word Work station, or for independent practice. You can have students work on individual sheets or if you’d like to prep this resource in advance (each quarter or for the whole year), simply staple the Mix & Fix cover page to the sheets you would like to include in the set to make a book for each student. Or, if you don’t have an industrial stapler, you can use a ring to link all sheets together. Another option is to display the direction sheet at a station (and have students work on one sheet at a time). What Sound-Spellings Will Be Included? Please let me know if you have ANY questions. You can email me at lyndsey@lyndseykuster.com. Thank you.